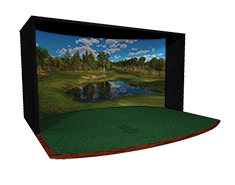 Kinney Billiard Sales customizes each golf simulator package to fit your space. Call 417-831-0209 for pricing. 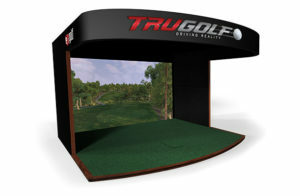 Our golf simulators are designed to be easy to install and set up. We sell a wide variety of sizes, as well, so you can choose the design that best fits your space. It starts with our Vista series golf simulators, four affordable simulators are adaptable enough to be set up almost anywhere. 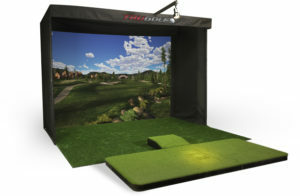 If portability isn’t your top priority, check out our Signature, Premium, or Horizon golf simulators. 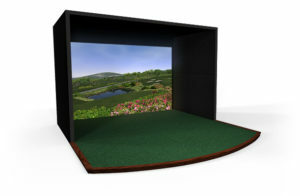 These golf simulators feature even more courses and incredible features, and a truly immersive golf simulator experience. 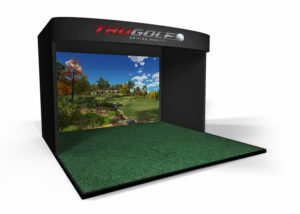 Every one of our models comes with industry-leading E6 golf simulation software, which boasts cutting-edge graphics and incredibly precise analytics to provide the most realistic experience possible and add measurable improvement to your game. If you want to make a bold statement on the course, but only have limited space to practice at home, then the Ross is the perfect choice. Named after the famous golf course architect Donald Ross, this green measures 2 feet wide by 8 feet long and includes 2 break stations – 1 on each side, for up to 50 different break combinations. 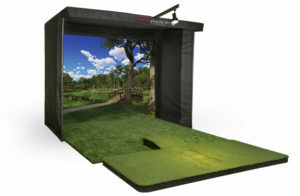 It can also be easily elevated on one end to practice those uphill putts that can make or break your game.The Ross comes with one cup and one side step, as well as a matching putter rack that holds up to 7 putters*. If you’re looking for the most realistic putting experience in a green that’s designed to fit any space and style, the Ross definitely delivers. Specs: 2′ Wide x 8′ Long. Available in Espresso and Natural finishes. Named for Perry Maxwell, one of the unsung golf course architects of his generation, the Maxwell may seem a bit understated, but don’t let its diminutive size fool you. With three break stations on each side of the green and a cup-end that elevates, the Maxwell offers up to 50,000 different break combinations to help you practice all the shots that matter most to your overall game. 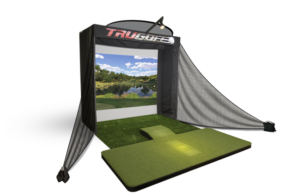 This putting green comes with everything you need to maximize your putting skills including three, 3′ x 3′ sections, with one cup, one headboard / ball-stop, a side step and a putter rack that holds up to 7 putters*. With the Maxwell in your home, you’re going to make precision putting on the course look all too easy. Specs: 3′ Wide x 9′ Long. Available in Espresso and Natural finishes. When you want the most realistic course-like challenges, the MacDonald is the ideal option. The MacDonald is our special tribute to CB MacDonald, one of the great amateur golfers of all time and the architect of the famed National Golf Links. Measuring 4 feet wide by 12 feet long, this green comes complete with 6 break stations for up to 50,000 different break combinations. The MacDonald also has the ability to be elevated on both ends so you can replicate those uphill and downhill putts that most impact your game. With one cup, one flag, one side step as well as a matching putter rack that holds up to 7 putters*, the MacDonald is the ultimate putting green for professional and amateur golfers who want to kick their game up a few notches. Specs: 4′ Wide x 12′ Long. Available in Walnut, Espresso and Natural finishes.